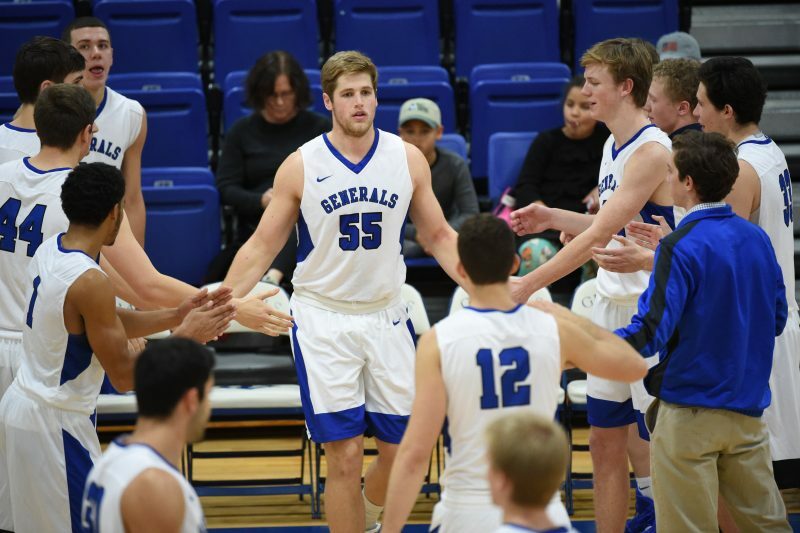 Murtha Selected for NABC Division III All-Star Game Murtha is the first W&L men's basketball player selected to compete in the contest in program history. KANSAS CITY, Mo. — The National Association of Basketball Coaches (NABC) announced on Tuesday the rosters for the 2018 Reese’s Division III College All-Star game, and Washington and Lee senior forward Clayton Murtha (Dallas, Texas/Highland Park) was one of the 20 players selected. The game will take place on Saturday, March 17 at 3:30 pm prior to the NCAA Division III Championship game at the Salem Civic Center. Murtha will compete on the 10-member East Squad. He is the first W&L men’s basketball player selected to compete in the contest in program history. Murtha led the ODAC this season in points per game (18.7), was third in rebounds per contest (9.2) and ninth in field goal percentage at 52.3 percent (181-of-346). He also totaled 12 double-doubles, 39 assists, 15 steals and 17 blocks. On the W&L all-time lists, Murtha finished his career third in scoring with 1,845 points and seventh in total rebounds (855). His career scoring average of 17.1 ppg is seventh. He is second all-time in free throws made with 568 and is second in free throws attempted (860). Murtha is sixth in W&L history in field goals attempted (1,171) and sixth in field goals made (634). He is one of only two players in W&L history to total at least 1,800 points and 800 rebounds in his career. Following the regular season, Murtha earned First Team All-ODAC accolades, Third Team All-Region laurels from D3hoops.com and CoSIDA Academic All-District honors. It marked the fourth all-conference honor for Murtha and his third time making the first team. He is the first player in program history to earn All-ODAC laurels four times, and the first to make the first team three times. The head coach for the East squad will be W&L alum and W&L Hall of Fame member Mike Neer ’70. Neer served as the head coach at the University of Rochester for 34 years and then at Hobart College for three years before retiring in 2014. He compiled a 629-346 record in his 37 seasons and led Rochester to a national championship in 1990. A standout for the men’s basketball team in his three seasons, Neer is still 14th on the W&L all-time scoring list with 1,289 points and third on the career rebounds list with 1,003. Joining Neer as an assistant coach for the All-Star Game is W&L Hall of Famer and former men’s basketball coach Verne Canfield. The all-time leader in wins in program history, Canfield led the Generals to a 460-337 overall record in 31 years (1964-95), including nine conference championships. For the All-Star Game, the teams are composed of two senior student-athletes from each of the eight regions in Division III, two seniors selected by online voting on D3hoops.com and two senior at-large selections.